Tonya has provided her Suavitel softener review, in the Morning Sun scent. Suavitel Morning Sun liquid fabric softener comes in a yellow bottle and can be found at a local Walmart, as well as lots of other stores. This fabric softener is a latin branded product, however it is one of the best fabric softeners that I have found in the stores. What makes it such a great fabric softener? For one, it has a wonderful scent, which is left on the clothes after washing and drying them. 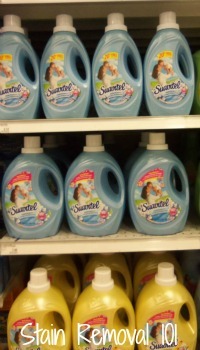 I don't have to use dryer sheets along with my Suavitel fabric softener. Secondly, it doesn't cause my children to break out. Suavitel performs well as a fabric softener while keeping any allergies to a minimum. Once you try it, you won't want to do without it. Another great thing about this fabric softener is that it comes in a wonderful variety of essences such as field flowers and lilac. This product will surprise lovers of other brands such as Snuggle. I highly recommend it to anyone who wants wonderful fragrances along with an awesome performing fabric softener. Give it a try! Thanks so much Tonya for your Suavitel softener review. 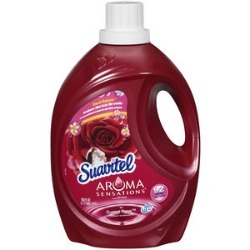 If anyone else uses this product, in any scent, in either liquid or dryer sheet form, you can share your Suavitel fabric softener review here. In addition, you can share your fabric softener review here, for any brand, telling me what you like, or dislike about it, and why. Mary provided a short review of the Suavitel softener scented like roses. It smells nice, but not as good as Downy. In addition, it leaves a weird film feeling on clothes. I don't know, maybe I'm just spoiled with using Downy or Snuggle for so many years. I bought it because it was 3 dollars less than the other brands. Thanks for sharing your review Mary. To me it seems like one of the biggest draws of this brand is the fact that it is lower in cost than the major ones. Does anyone else have an opinion, good or bad, about this or any other fabric softener? If so, please share your fabric softener review here. Here is another review of this fabric softener, from a reader. The smell of Suavitel is awful. I opened a bottle and the smell was so strong I had to take it outside. I have Parkinsons and my sense of smell is almost nill. If I could smell the product that strong something is wrong. They need to tone down the fragrance way down. I will not buy it again!!!!! Sorry to hear it really bothered you. I'm curious, has anyone else had an allergic or strong reaction to this fabric softener? If so, please share your experience with me. 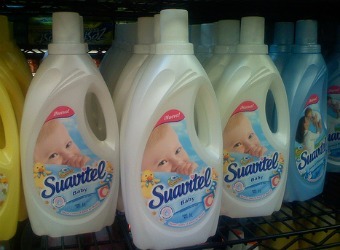 I had tried Suavitel before and it just could not compete with my Downy. Then I tried the Suavitel Sunset Rose (reminds me of my mothers fresh cut roses). I hate you Suavitel, you have gotten me hooked and now I have aided in getting my sister hooked. We call each other and compare notes after laundering on how we love sniffing our sheets at bedtime and our clothes after using this product (use this product and put your head down in your top/blouse/shirt during the day, you will look strange but ahhh, wonderful smell). Now we are having a hard time finding it in our area because I think a lot of people have discovered it. The next time I find this product, I am sure to stock up. Thanks for the product. I really enjoy this product as well. What's funny is I didn't know a lot of other people did as well. I'm doing a persuasive paper for school about a product. I could choose any product that I use. I decided to use Suavitel because I wanted others to know about it and use it, because I didn't think many people did, and they should. IT'S GREAT!!! Suavitel Ultra in the Field Flowers scent is one of the best fabric softeners I have found. I originally bought it because it was cheap and in its blue bottle, it resembled my normal fabric softener purchase, and to my surprise, I found that it works as well as the more expensive brands and smells just as good! I like the ultra formula because you get more loads in one bottle that is smaller and lighter than the regular fabric softener formulas and anything that is lighter and easier to pour is a plus, because I have neuropathy in my hands and have a hard time lifting even a gallon jug. After checking out the label I was pleasantly surprised that it is manufactured by a reputable well known company, the Colgate Palmolive Company. I have tried one other scent when the Field Flowers wasn’t available and that was the Enchantment scent in the Ultra formula. I like that one, but not as much as the Field Flowers. I've found there is need to use dryer sheets with a concentrated liquid softener. I used sheets for many years and was unhappy with the scent not lasting long enough. If you use this product, in either the liquid or dryer sheets form you can share your review here. In addition, you can share your fabric softener review here, of any brand, to say why you love (or hate) it. I will note that some readers have had allergic reactions to this brand. Click the link to read their stories or to share your own story if this has happened to you. Washed my new white tee, used Suavitel with quick drying formula. Ugly splotches on my shirt, quickly washed it again, stains remained. I've scrubbed, soaked, washed I'm so upset. Scared of product now. I'm going to try some ideas I've found online. Any suggestions? Sorry to hear that Jenni. Here's my article on how to remove fabric softener stains. Hopefully it can help. I love this product!! It smells so good. I wish they would have this in dryer sheets. I will not buy any other fabric softener, it's the best. My daughter started me with it, then she started my mother with it, so she has everyone hooked. The ladies on the job, because I wash our aprons, they loved the smell. Thank you so much. I originally bought Suavitel because of the price. What a pleasant surprise! It was great! All the scents are pleasant. I have No PROBLEMS what so ever with all the Suavitel softeners. Who designed the cap, a graphic designer?? It is not for arthritic hands. Just drives up the price. I really like this brand, I buy it all the time. However this time I bought it, it seemed to be watered down or something. I really hope this doesn't happen again or I will have to buy a different brand.